Atlanta's traffic is legendary and the Georgia DOT says the increase in truck traffic needs to be addressed. Because the Port of Savannah and the Panama Canal have been deepened, more freight is coming in which translates to more semi-trucks traveling in and out of the Atlanta hub. GDOT estimates trucks carry 75 percent of the freight in Georgia and expects truck traffic to double by 2040. 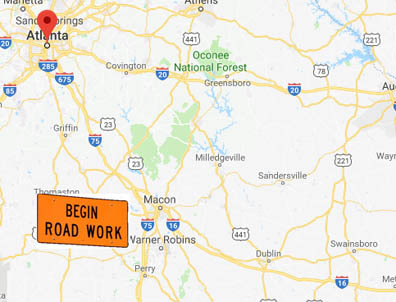 The project is estimated to cost about $1.8 billion and GDOT says it should reduce northbound traffic delays by 40 percent. The department says another benefit to the commercial vehicle only lanes is lower maintenance costs on the general purpose lanes because without the heavier truck traffic the auto lanes will see less wear. As truck platooning and autonomous vehicles become more possible, GDOT says the new truck-only lanes will be potential testing grounds. The state is waiting for a response from the federal government regarding funding for the $1.8 billion project, but say that, regardless of federal funding, Governor Nathan Deal says GDOT will be moving forward with the project using funds gathered by the state’s Transportation Funding Act, which raised fuel prices back in 2015. Georgia transportation officials are expected to select a general engineering consultant by the end of the year. Construction is slated to begin in 2025 and to be completed by 2029 . The truck-only project is one of 11 new projects under what the state calls the Major Mobility Investment Program.